If you’ve started playing Magic more recently, you may not have previously witnessed a particular play that people of a certain age find incredibly frightening: someone attacking with a lone Birds of Paradise or Llanowar Elves. Around the turn of the century, it telegraphed an incoming Might of Oaks; in the Kamigawa era, it showed that a ninja was coming. We’ll soon have to add this guy to the list, and a variety of scenarios involving low-stat blue creatures attacking huge green monsters to the list of scenarios that will haunt people’s nightmares. Of course, often the best play is to block anyway so they only get the copy and have to lose a smaller creature, but then you still have the copy to deal with. And aside from all that, if there isn’t anything to copy, he can come down as a 2/2 pirate who attacks alongside the others. That’s not stellar, but it’s not nothing. The second-cheapest Clone effect available only asks that you be in two colors (which Pirates are in, no biggie) and that you have attacked this turn. I like this card because you can play it as a 3-mana 2/2 in the worst-case scenario, getting rid of the usual downside Clone effects have, but the upside is very, very real. 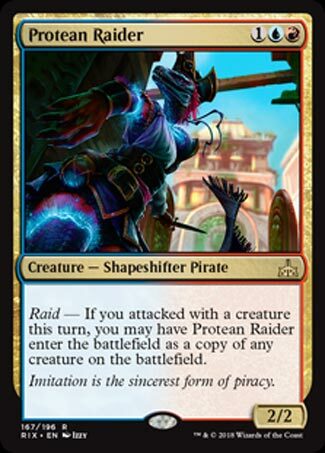 This is a fairly-aggressively costed creature that has a lot of potential and flexibility, and I can see it putting in a lot of work in this Standard, giving Pirates a way to keep pace with more monstrous threats (and giving Temur Energy another toy to play with).